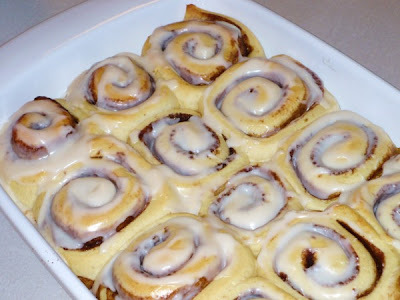 Of all the cinnamon roll recipes I've tried so far I like this one the best. It's fast and the rolls are nice and moist. I just don't have the patience to wait for dough to rise twice. I have not tried freezing these rolls, but I imagine if you freeze them before they rise then thaw them in the refrigerator, they could work out. The easiest way to cut cinnamon rolls is with dental floss, but a serrated knife works well too. If you want to try the dental floss method, cut a piece of dental floss about 18 inches long, slide the center of it under the rolled dough, cross the two ends over the dough and pull through. It makes a perfectly even and smooth cut. Your "warm" liquids should be between 120 - 130 degrees. I halved the icing recipe for the rolls you see in the photo above. I wish I hadn't. Combine flour, yeast, dry pudding, 1 Tbsp. sugar, and salt in mixing bowl. Beat in milk, water, and melted butter. Add egg. Once dough comes together, knead in mixer on 2nd setting for 8 minutes (or knead by hand on a lightly floured surface). Spray a bowl with cooking spray; roll dough into a ball and place in bowl, then flip dough over. Cover with a towel and let rest 10 minutes. Meanwhile, combine brown sugar and cinnamon in a small bowl. Lightly flour work surface and roll dough into approximately a 10x17 inch rectangle. Spread with softened butter; sprinkle evently with cinnamon mixture. Beginning with long end, roll dough into a 17-inch tube. Slice into 1-inch rolls. Place rolls in lightly greased baking dish and cover with plastic wrap. Set rolls in a warm place and let rise until almost doubled in size. Preheat oven to 350 degrees. Bake rolls for 15-20 minutes. For icing, beat powdered sugar, milk, butter, and vanilla until smooth. Spread over warm rolls and serve.